Vapor Shark has collaborated with Kangertech to bring the groundbreaking temperature limiting technology of the Vapor Shark rDNA 40 to the popular V2 Series (Aerotank Mega and Aerotank Mini) and dual coil tanks (AeroTank Mega, AeroTank Mini, AeroTank, EVOD 2, T3D, Mini Protank 3, Protank 3, Genitank and EVOD Glass) from Kangertech. These replacement atomizer heads feature 0.18 ohm coils wrapped from pure Nickel (NI-200) wire, allowing you to monitor and limit the temperature your coils are reaching. 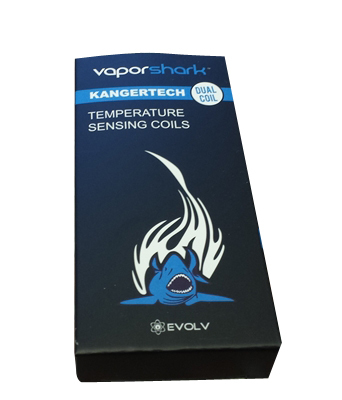 Because these coils are only for use on devices powered by Evolv's DNA 40 board, the color of the silicone ring on the atomizer heads has been changed from clear to Vapor Shark blue for increased safety and ease of identification. Subohms can be dangerous if you do not have the right equipment. Use an ohms law calculator and check your amps - be safe!! Nickle turns extremely dangerous when heated too high. Not for use in Kanger Subtank. Only Suitable For Use On Devices Equipped With Temperature Sensing And Limiting Features And Uses The DNA 40 Chip.